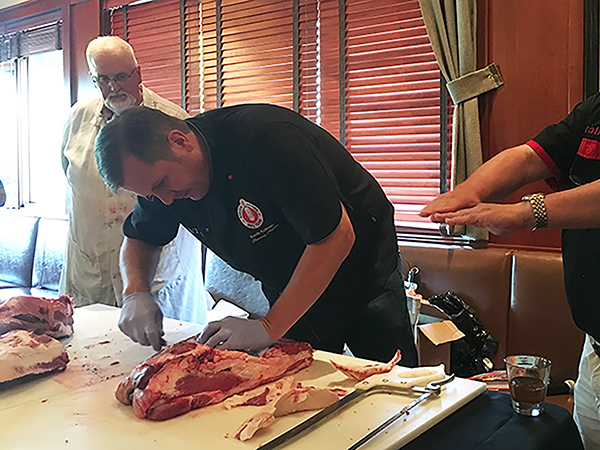 Recently, I was able to attend “All About Brisket,” a two day event at Weber Grills Restaurant in Schaumburg! At the class, we learned all about brisket through multiple panel discussions, plenty of taste-testing and more! Being new to the world of smoking, it was important for me to hear the basics of brisket! Brisket comes from the front of the cow, towards the bottom near the cow’s legs. This meat becomes a tough cut of beef because of how often it is used by the cow. This is the reason slow cooking and smoking has the best results. When buying brisket, it is important to know what to look for. For the best brisket, look for white fat, deep color of the meat, and good marbling on the cut. When it comes to brisket, there are two different cuts: the point and the flat. The point cut comes to a point at the end and often will have fat running through the cut. This fat helps to make the cut juicy and tender. If you are looking to shred your meat, the point is your best bet! The flat cut is a leaner cut of meat. If you are looking to slice your meat, the flat is your best bet! At “All About Brisket,” I was able to watch meat masters carve the brisket down to the essentials and separate the flat from the point! Before smoking your brisket, it is important to trim down the excess fat to 1/8” to 1/4” around the meat to reduce the time for cooking. Whatever fat you leave on the brisket, should be left on the top of the meat! This will eventually drip down onto the brisket and allow it to moisten the meat while smoking. The brisket may take a long time to cook but trust me, it is worth it! For more events, check out what the Weber Grill Restaurant near you has planned next!